Last year, Weber State was the preseason pick by both the coaches and media to win the Big Sky Conference, in part thanks to preseason BSC POY Damian Lillard. For awhile, things were mostly going to play, as WSU was off to a 5-3 start with losses only to major conference opponents. We know what happens next. Lillard injured his foot in the second half of the ninth game of the year against Tulsa (and was granted a medical redshirt), and he may have taken Weber State's conference title hopes with him. But that is not quite the rest of the story. While they initially went into a slump when Lillard got hurt (going 4-6 in their next 10, including the Tulsa game), they rebounded to win 6 in a row and 8 of the next 9, including wins over Northern Colorado, Montana, and Northern Arizona. How did they do that without their best player? One reason is they were one of the best shooting teams in America last year, shooting 40.4% from beyond the arc, fifth in the country. Who are these guys? The best shooter of the bunch is Scott Bamforth, who had an excellent season as a sophomore after spending one year in the JUCO ranks. He shot 78/160 from behind the arc, a cool 48.8%, best in the Big Sky and 4th in the NCAA (over the regular season, where he shot 50%). 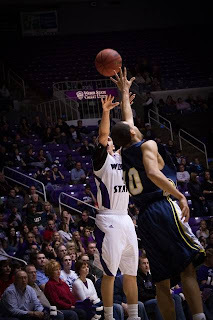 For his marksmanship he was named First Team All Big Sky and the Newcomer of the Year in the Conference. His True Shooting % ranked in the top 20 in America (he is also a great FT shooter), and he should have a great chance for postseason awards once again. Plus, Weber State fans might have a soft spot in their heart for him thanks to a particular memorable shot. Kyle Bullinger is another star for the Wildcats, as he joined Bamforth on the first team All-Conference. He shot an excellent 43% from downtown on 126 attempts, which is made all the more impressive by the fact that he is the team's leading rebounder. He is poised for another great year as a senior, and should be one of the best players in the Conference. There is Lillard himself, who does pretty well outside the arc. He got 34.5% in his time last season after shooting 39.3% his sophomore year and 37% his freshman year. Teams have to respect his outside shot, which makes him all the more dangerous (because if you guard him too close, he will beat you off the dribble). Lillard has a full offensive repertoire, which makes him a potential favorite for the preseason POY award. Byron Fulton was the Conference Freshman of the Year, and his outside shooting was a big reason why. He was 24/50 from 3-point land, good for 48%, and could see an even bigger role this year with the graduation of big man Trevor Morris. He is another guy that keeps defenses honest, because he will hit shots if you give him a good look. Jordan Richardson is a guy that didn't have a huge role last year, but he did shoot 33.3% from outside as a freshman. He will likely be fighting with incoming freshmen Gelaun Wheelwright, Shai Fields, and Michael Brown for playing time. Now that is a good crop of shooters Weber State has coming back, all of which will be made even more dangerous by the attention that Damian Lillard will receive this year. It is tough to say that Weber St will shoot as well this year (over 40% from outside), but I think it's safe to say they are the best shooting team in the Big Sky Conference.